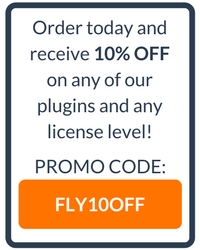 How one of the biggest names in blogging leverages the most widely-implemented WordPress learning management system plugin. Before the iPhone, Facebook, Google, or WordPress were part of our daily routine, David Risley was already making a full-time living online. He’s been building successful businesses online for over 14 years. I always cringe when I hear the word “guru”, but if anyone deserves the title in the world of online subscription-based training, it’s David. His first site, PCMech.com, focused on helping home computer enthusiasts with insights and how-to guides. It quickly accrued a massive following. During a product “re-launch” in 2009 for the members-only training offered on the site, he generated $12,047 in 10 days. Not bad, right? 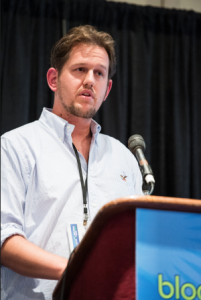 David has since focused his efforts on sharing his expertise in driving major traffic to online businesses, hitting the digital marketing speaking circuit and building a new brand around his Blog Marketing Academy project. The Blog Marketing Academy is a members-only training resource for online entrepreneurs interested in finding ways to generate sustainable, high-quality traffic, unique and engaging content, and the most targeted monetizations methods. While there are plenty of courses out there which teach you to game the search engines and throw Adsense on your site while outsourcing your content production to someone for $5 an article, the Blog Marketing Academy is professional training for building a real online business. 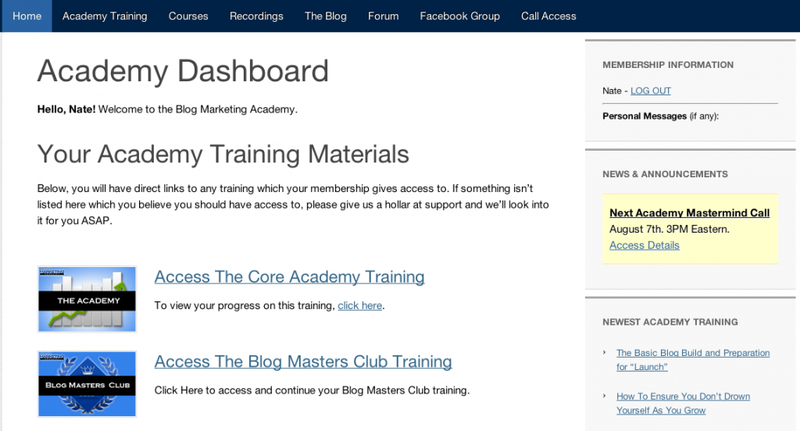 And during David’s recent overhaul of the Blog Marketing Academy, he trusted WP Courseware as his learning management system plugin to deliver his premium training content to thousands of members. Ben and I don’t often pat ourselves on the back, but we were pretty proud to have WP Courseware become such an integral piece of David’s very successful business. Let’s face it…since we launched WP Courseware nearly a year ago, more than one other developer has followed suit in an attempt to replicate the ease of use and full feature set which the plugin provides. So why would one of the most prominent entrepreneurs in the blogosphere choose WP Courseware? Well, we decided to pose this question directly to David. His response? “When it came to the Academy, my ideal setup would include a few things, including the ability for students to mark modules completed when they are done, and track their progress, and the ability for me and my staff to track student progress so we can follow up if people aren’t moving. While I can’t reveal much of David’s secret method to online success which he shares with members of the Blog Marketing Academy, he does take the training he delivers very seriously. He’s structured the training in easily digestible course units which are grouped into several overarching modules that each focus on key elements of building a business which successfully pulls in qualified traffic and presents relevant offers. I will say that his module on time management for online entrepreneurs alone is worth the price of the course and most online business coaching systems ignore this important aspect entirely. David’s using a couple of custom code hacks that he wrote (yeah, he’s a pretty smart guy), however, the training area primarily utilizes WP Courseware right out of the box. 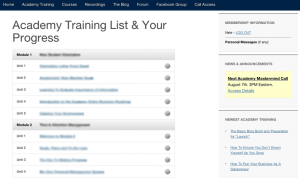 Upon logging into the Academy, the members‘ area includes links to all of the resources provided with a subscription to the training, including two courses, past recordings of Q&A and mastermind group calls, a private forum, access to a private Facebook group, and information on upcoming private webinars. You can utilize a page like this, too, by simply directing your logged in users to a “dashboard” page. And it doesn’t need to be complicated, as you can see in the screenshot. This is a great lesson in engagement! When users log into Facebook, they receive updates in their news feed regarding what’s going on in any Groups with which they’re involved. Relying on a forum requires that members have a separate way of subscribing to forum threads or that they visit your site to engage with you. Why not utilize Facebook Groups for your training and allow your subscribers to see what’s been going on within your community? Another great feature David is using within the Blog Marketing Academy is custom image buttons to link to the individual training module pages. He then places the WP Courseware shortcode for each individual module within that page. This is a strategy that Ben and I used on one of our training sites a couple of years ago and it works great. It’s very easy to do and creates a visually attractive way to provide access to each of your training modules. David also provides a link within the members‘ area to a “Global Access” view. On this page, he utilizes the WP Courseware shortcode for the entire course. While this might present a case of information overload if he didn’t first present users with the custom image button links to each module, it does allow users to view all course units at once to find those that they want to return to or future units which may be more relevant to their specific training needs. What a great example! Thank you for sharing. In answer to the question “Do I hear any votes for a future WP Courseware update to include custom image buttons for modules?” the answer is yes, please! Thanks for the great posts guys – always love the inspiration! I am curious, where is David Risley at in his business today since this was written in August 2013 and is he still using WP Courseware? Thank you for your kind words. 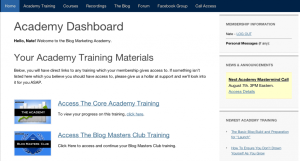 Yes, as far as we know David is still using WP Courseware with Blog Marketing Academy. We do have it on our feature request list, however, we’ve not seen many requests for this particular feature. +1 for custom image buttons! I would LOVE to see this as a feature. The aesthetics of that idea alone are worth it.